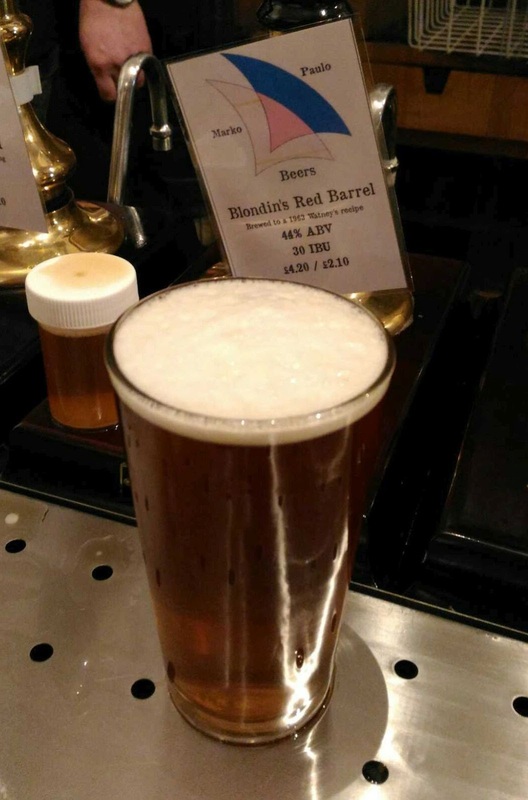 BeerViking: What really killed Watney's Red Barrel? What really killed Watney's Red Barrel? People who remember the Keg Wars of the 1960s still talk of how keg bitters were pasteurised and fizzed-up, knocking much of the character out. Some of the stupider ones also talk of today’s keg craft beer as if it’s treated the same (they’re wrong – much of it would fit CAMRA’s definition of real ale), and a few will also trot out how keg bitter was supposedly brewed cheaply and “full of chemicals”. Full of chemicals? For the pedant, pretty much everything is a chemical – salt is a chemical, even water – but that’s not what they mean. They mean additives and impurities, things that probably wouldn’t be permitted under food regulations. Again, they’re almost certainly wrong – unless you count “processing aids” such as PVPP*, which is permitted under the Reinheitsgebot for instance. Yet they might also be sort-of right, in a weird way that they probably wouldn’t recognise, and for something that they would almost certainly not think of as a “chemical” – and that is sugar. So when I heard that one of my local brewpubs, The Owl and The Pussycat in Northfields, had brewed a cask recreation of 1963 Watney’s Red Barrel to a recipe devised by beer historian Ron Pattinson, I knew I had to try it. Earlier this week, I did just that, and it wasn’t half bad! 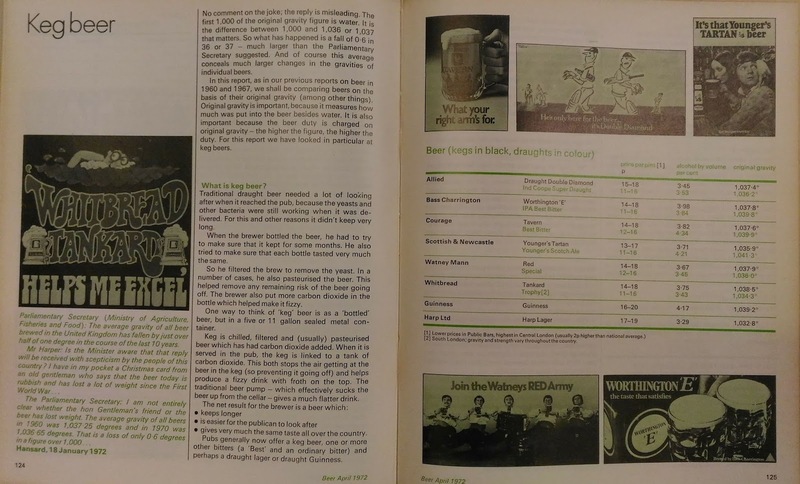 It was also by far the pub’s bestseller, selling almost an entire firkin on the first night it was available, which will have had a fair bit to do with nostalgia and curiosity. As I sipped my Red Barrel, a fairly pale amber-brown beer of 4.4% ABV, I detected light malt, a moderate and slightly earthy bitterness, and touches of biscuit and fruit. Yet I also found myself thinking how unlike modern bitters it was, even the keg ones. There’s lots around the same strength, but even the golden ones tend to be fuller-bodied, a little sweeter, a little more flavour-forward. It was when I spoke to the brewer that I got an inkling of what was going on. He mentioned that the Red Barrel recipe was very different from their other ales in two ways: it contained a significant amount of sugar, and was relatively highly attenuated, meaning more of the sugars were fermented out to leave a drier body. 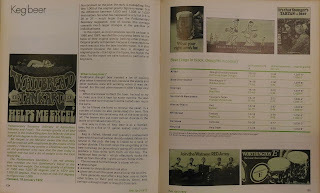 Re-reading some of Ron’s writing on those 60s beers, it makes sense. The grists of the period – grist is the mixture of malt and other fermentables – were typically 10% to 15% sugar (although he notes that Red Barrel used less than that). The typical reason for adding sugar and other adjuncts (sources of fermentable sugars) is to lighten the body, in a milder easy-drinking, don’t-frighten-the-horses sort of way. It can also improve stability and heads retention – and yes, it can save money (though not always). So maybe, just maybe, the real reason people found 60s keg bitter insipid wasn’t just the blandifying effects of pasteurisation and fizz – though I’m sure they were (and are) important – but the fact that it started out as a light-bodied and fairly dry brew. In cask, it could just about overcome its limitations, but killed and kegged, well the poor thing didn’t stand a chance. *PVPP (polyvinyl polypyrrolidone, or Polyclar) is a powdered plastic used as a clarifier. Anti-Reinheitsgebot campaigners say that the rule is simply a marketing tool of the big German brewers – and that it lets them cheat by claiming the PVPP is filtered out after use, so it doesn’t count as an “ingredient”. The German beer purity law also failed to prevent a 2016 scandal when some beers were found to contain traces of glyphosate weedkiller at a level up to 300 times that permitted in drinking water. The beers had been made only with malt, hops, yeast and water of course, but the malt had been made from contaminated barley. **Around 20 years ago I sometimes drank a perfectly acceptable cask ale branded as Worthington E, but I'm pretty sure it was nothing like the 60s version! Much of what CAMRA was objecting to at the time was not actually keg as such, but top pressure, a fact largely forgotten nowadays. Good point, I kind of elided that under "fizzed up" but you're right to pull it out. And I'm sure some of the stickinnamuds will claim cask breathers are no better, or something like that! Pretty much every beer brewed between 1880 and 1970 contained 10-15% sugar. It was used fo a variety of reasons: in darker beers for flavour and colour. It's kind of amusing that it's still used in lots of the Belgian beers that beer geeks admire so much, yet those same geeks are so dismissive of adjuncts elsewhere. And now that you remind me, the unexpected subtle variation in mouthfeel I noticed in the Red Barrel was slightly reminiscent of some Belgian beers.